This morning at the breakfast table, Mary asked me, "Mom who do you want to rule? Obama, Jesus, or Dr. Silverman (my OBGYN)?" After we solved that problem, she asked me, "Mom when I grow up will I be a mom, just like you?" Yup, Mary. (no caffeine yet, my answers are bare bones.) "So does that mean you'll die, because there'll be two of us?" So, good morning. There's so much to say, I don't know where to begin. Your emails this past week have provided more comfort and encouragement than you know. I was overwhelmed by your response. It just reinforced my decision to share all of that with you. Thank you..which doesn't seem like enough, but thank you. I'm feeling much better today. The past few days I had to take a pill which…ahem, contracts things, if you know what I mean. I was really, really dreading it, and it was stressing me out. And it turned out to be nothing at all—just made me feel a little loopy. This morning was the first morning that I woke up and really felt completely like myself again. It is a good feeling. I have lots of thing on my to-do list today, but still have the lessons of being still in the back of my mind. I have lots of comforting things planned for our week, some bread baking, some felting, some carving of pumpkins and roasting of seeds. If you hurry, I'm giving away a starter kit of gdiapers over at babycenter. These are the hybrid diaper–an easy middle of the road diaper for those who want to make the switch from disposables to cloth diapers or something greener. I was sent a starter kit to try, and I am since hooked. A total convert. (And those little g pants that go over the liners? Way too cute.) You can read more about my review of them in the post. 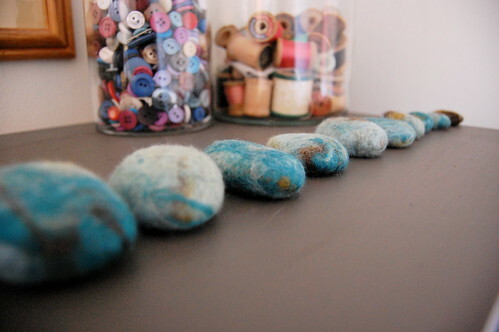 These beautiful felted stones are from Lisa of Lilfish studios. 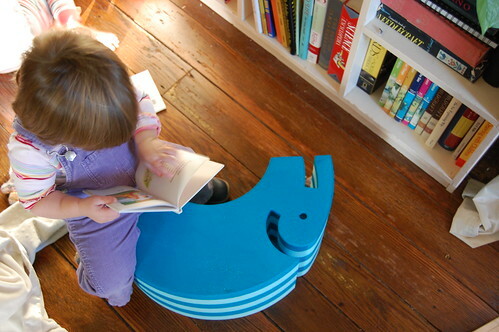 I absolutely love them, so does some child in my house who lined them up like this on top of the bookshelf. These stones are responsible for my need to felt something this week. We'll see what we come up with. Alright…my time is over. Everyone is dressed and booted up, ready to go check on our chickens. We moved them into their real chicken house/coop last night for the first time. We're anxious to see how the ladies liked it. Are you writing down the girls ‘sayings’ on paper for posterity?! Bless her! Have to tell you that from here we are drooling and turning green with envy at the cushion in the top photo…the one with a reindeer or a moose on! Did you make it?And your floors are beautiful, and the stones and the….yep. I love your house! I’m so glad you’re feeling better. And thank goodness for those sweet girls to keep you company each day. Aww, I’m glad you’re feeling much better, Molly. That’s a rough road to hoe, and it’s great that you and the girls are back at it today. Oh man- those conversations before caffeine. It’s cracking me up! I am glad you are feeling a bit better. Glad you are feeling better. Those rocks are pretty cool. I have always wanted to try felting but to be honest have a hard time finding some roving for it. Can’t wait to see what you come up with. Glad you’re feeling more like yourself this morning. Don’t be too rough on yourself if you have some difficult moments though – you deserve as much time as you need. Good luck being still with small ones pulling at your pant leg! I love conversations with little ones and the things they come up with! I’ve been interested in how the gdiaper works. Thanks for the info. I use bumgenius cloth and they are easy peasy, even with two in diapers. My husband washes them most of the time which makes it way easier on me! glad to see you back in this space. Love love love your cozy living room! I just love that front room in your house. Who do you want to rule? that’s cracking me up. Your room looks so cozy. I hope you have a gentle week. Those felted rocks are beautiful. I wonder how easy they’d be to make? Glad to hear you’re recovering physically and mentally. i’m so sorry for your loss. i wasn’t online this weekend to respond to your post as we were observing the anniversary of our first daughter’s birth and death dates, she would be 11YO. losing a child at any point is a terrible loss, an interuption of your future, but also a time to take stock and realize the blessings that you have. 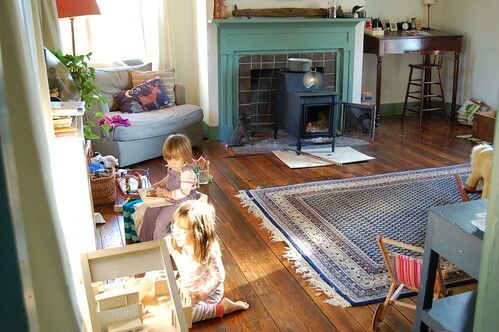 i absolutely adore the homeschooling photos and how “actively” all three of your girls are learning. they are beautiful. Those felted rocks are charming!I am glad you are feeling a bit better. i wanna felt something too. but (secret.) i’ve never felted anything before. i’ve had plans. and instructions. and encouragement. but i’ve never done it. So glad to hear you are on the mend. Looks like you have a tremendous support group in your readers, not to mention your family. I really love your posts over here. They never fail to inspire me to be more present, more aware, more grateful.